Jane Hirshfield is the author of seven books of poetry, including most recently Come, Thief (Knopf, 2011), just released in paperback. She has also written a now-classic collection of essays, Nine Gates: Entering the Mind of Poetry (HarperCollins, 1997), and edited and co-translated four books collecting the work of world poets of the past. Hirshfield’s poems have appeared in The New Yorker, The Atlantic, the Times Literary Supplement, The Washington Post, Poetry, The American Poetry Review, and seven editions of The Best American Poetry. Her honors include The Poetry Center Book Award, the California Book Award, the Donald Hall-Jane Kenyon Award in American Poetry, finalist selection for the National Book Critics Circle Award, and fellowships from the Guggenheim and Rockefeller foundations, and the National Endowment for the Arts. A frequent presenter at universities and literary festivals both in the US and abroad, in 2012 she was elected a Chancellor of the Academy of American Poets. 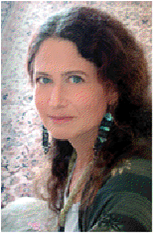 In this interview for Poet’s Quarterly Arthur McMaster discusses craft, poetic form and luck with poet Jane Hirshfield. Your poems have such a sense of effortless completion. Let’s begin with the idea of Inspiration and Perspiration. What pleases you more in writing a new poem, the first solid draft or the completed revision? A work of art is a silo of time. Some sense of its overfilledness is part of what makes art feel like art. Whether that necessary surplus of attention went into the making of that particular work or into a lifetime of preparation, it’s there. (And isn’t it interesting we use the word “work,” when we speak of the made things of art?) I’d say that even the seemingly effortless in art is at least partly disguised long effort, sometimes disguised even from oneself. A sumi-e circle comes in a single moment’s brushstroke, yet it shows the hand of the full life that came before. There’s a moment for me in writing a poem when the poem discovers its own deepest question and task; finding that moment is pivot and center, reason and desire. But centers are centers of something more, and when writing, you don’t stop when that discovery appears—if anything, you press forward harder, with increased trembling. Writing—however awful and arduous it sometimes feels—is a pleasure, yet it isn’t about taking pleasure. No one stops to congratulate a completed draft. As soon as a poem is first-draft finished, I begin to revise. Changing a single word for the better can feel as consequential as writing something new… how much more, then, saving a poem I thought might be unsalvageable. A few of my simplest-seeming poems have gone through eighty-five drafts. Once you’ve found the right words, it feels they already existed all along. They aren’t flamboyant displays of your own encyclopedia, they’re just the perfect-sized stepping stone set down exactly where the forward-moving feet of your life need each one to be. Sometimes they might seem plain, sometimes rarer and odder, but that isn’t the point. In either case, those words are not an ordinary sidewalk taking you from obvious point A to obvious point B. The right words in a poem are the ones take a path that was somehow unknowable until it’s been travelled. They make the path, by their meaning and by their music. C.S. Lewis wrote this tiny homily: “We read to know we are not alone.” Who are you reading now and what do you want from poets whose work you may not know well? In the first half of a writer’s life, everything is new—the classics of your own tradition are new, your contemporaries are new, the generations just ahead of you are new, the world’s great poets are new. The shiver of discovery is frequent. At some point, that grows rarer, both because so much is no longer completely unknown to you and because, very likely, a lifetime of reading great poetry raises the bar. This means that a lot of the time now, I read poems and poets I’ve travelled with for a long time, whether Emily Dickinson or Wislawa Szymborska, Yeats or Milosz, Koch or Merwin, Horace or Su Tung Po, Keats or Borges. I first encountered Ann Carson in the 1980s, when I read her early prose book, Eros the Bittersweet. I still find that book thrilling to revisit. The new discovery for me now is very often a poet in translation, sometimes found first in a single poem. The Turkish poet Edip Cansever’s “The Table,” for instance, from Dirty August, translated by Richard and Julia Tillinghast. Just this morning, someone sent me “Illness,” a poem by the Portuguese poet, Manoel de Barros. That sent me off to find the book it’s in, Birds for a Demolition, which is translated by Idra Novey, a younger poet who was for me, along with Eduardo Corral, one of the distinctive discoveries of the 2012 Dodge Poetry Festival. Some other young—or more recently visible, even if not technically young—poets I watch for now are Christina Davis, Richard Jarette, Bridget Lowe, Katie Ford, Rebecca Lindenberg, just to name a few. Of poets younger than me with several books out, to pick two names almost arbitrarily, Terrance Hayes and Matthew Zapruder both seem to me exceptional voices.) I remember when Rusty Morrison’s the true keeps abiding its calm arrived in my mailbox as a prize-winner from the Academy of American Poets—I was rivetted, completely won over. A few years later, I chose her next manuscript in a blind reading for Tupelo Press’s Dorset Prize. But making lists of names always leaves me both sad and uneasy—so many are left out who on another day would not be. I very much like the part of your question which is least answerable— what do I want when I read an unknown poet or poem? I want to be startled, peeled, changed; struck dumb and open. I want some discovery, new realms of language or being. And I want to be made voracious for more—for more of this writer’s words, but also for more of the world, more life; more grief, more possibility, more recognition, more range, more mystery, more saturation, more subtlety, more terror, more strangeness, more courage, more longing, more love. You have spoken of Emily Dickinson’s phrase “tell all the truth but tell it slant.” I infer from that statement that the poet withholds something, perhaps something vital. How much work do you believe the reader should do in digesting a well-conceived poem? Frankly, my own bias is that it is too easy to tell too much. What do you think? I could talk about this for an hour, for days. One thing that makes reading poetry lustrous is that the words set down on the page are not a destination, they are a recipe. A poem is a collaborative art: an arc of experience happens first in the writer, then in the reader. If the reader were told everything, they’d be left passive, not co-author but recipient, inert and bored and unexpanded. If not told enough, they’re left simply confused and excluded. I can love poems that are baroque and poems that are spare, but that set of choices isn’t really at the center of Dickinson’s slantness. Slantness is in the doors a poem leaves ajar, the places the reader must walk through before the poem can be felt completed. To answer the question in a narrower way, I do lean toward poems that give the clues but leave the reader to solve the mystery. (And that mystery, in the best poems, doesn’t stay solved—it is volatile, vanishing stuff, revisitable for a lifetime, each time new.) Haiku are like that—not pretty images laid out for you to ponder, but cues toward a way of seeing and feeling the world more sharply and deeply. Heightened awareness is what haiku are keys for unlocking. Sonnets are like that as well—at the turn, something must happen inside you, something hidden beyond and inside the words, or they are merely clever musical descriptions. Along their ways, the Odyssey is like that, Paradise Lost. The good reader learns to recognize that in even the most restrained poems—if they are good poems—there are repositories of crisis, places of bedrock exposure. To answer more narrowly yet, there are subjects, emotions, experiences, recognitions, that can never be packed into the suitcase of words. Yet words can point us straight into their heart. “After,” a poem says, and we see what came before it. If a thing is unsayable, leave it unsaid but heard: this is what poems exist in part to do. For me, anyhow, no one kind of poem could be “best.” Why would I, as a reader or writer, want to live a smaller life than I might? Two of my early loves, back when I could read the original Latin, were Horace and Catullus—surely the Beat poets of ancient Rome. No one ever says I am in the lineage of Horace and Catullus—yet my pen knows that I am. For “making it new,” the second chapter of Nine Gates: Entering the Mind of Poetry, “The Question of Originality,” is entirely about this idea and what it means. Mostly, a writer can’t help but be original in exactly the ways they will be, and also can’t help but be of their own time and its dictions. Chasing after the “new” is looking for fools gold. (The one exception to that might be Whitman, whose immensity of ego was matched by the immensity of his transparence to others—and even he used the King James Bible for his style’s basic template.) A better compass into new terrain is to allow one’s idiosyncracies—of mind, of heart, of tongue, of sympathies, of interest—full range. Dickinson and Hopkins are examples of that kind of original genius—they wrote as they had to, in voices simply and entirely their own, because they heard their own voices so clearly. The opening lines in your poem “August” (Given Sugar, Given Salt) are: “You work with what you are given — / today I am blessed, today I am given luck.” What are you working on now, Jane? New poems, as always, one at a time. Soon, I’ll be turning also to the project of turning the last fourteen years of essays into book form. The collection has been accepted, though as yet there’s no title and no publication date. Like the investigations in Nine Gates, these new essays are all attempts to enter my single question: “What makes good poems good, what makes them poems, and how do they do it?” The angles of entrance are many, but that is the question. Arthur McMaster’s poems have appeared in such journals as North American Review, Poetry East, Southwest Review, Rhino, Rattle, and Subtropics, with one Pushcart nomination. He has two published chapbooks, the first having been selected by the South Carolina Arts Commission’s Poetry Initiative, in 2008. Arthur holds an MFA in Creative Writing from the University of Florida. He teaches creative writing (poetry and fiction) and Twentieth Century American literature, at Converse College, in Spartanburg.